Every single thing that occurs in our lives can be viewed through two lenses. Positive or Negative. When we view a circumstance as negative, it can color not only that one incident but the entire day, week, month or even year. The converse is also true! When I choose to look positively at each circumstance, good, bad, neutral then I can create a habit of behavior that will give me a positive foundation for an enjoyable life. It is 100% our choice in this outlook. 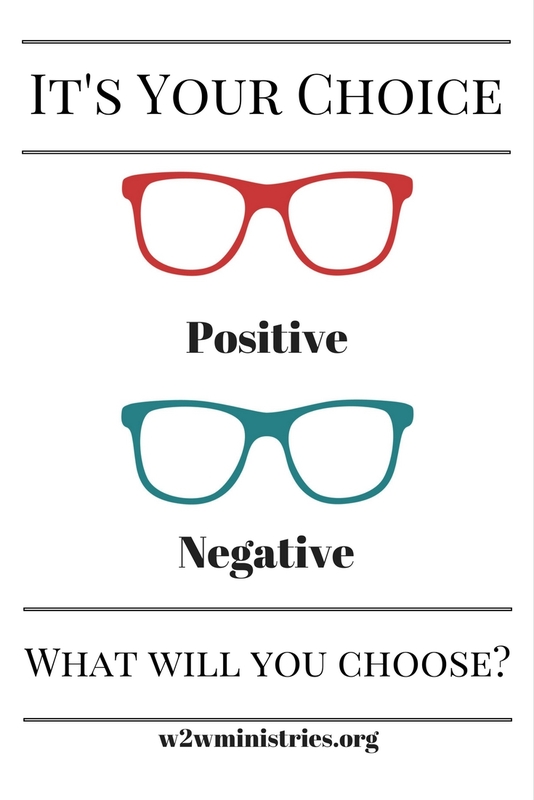 We can cultivate a positive outlook over time, and the choice can become easier to make, but it is a choice regardless. I recently had a very Monday Monday. I won’t elaborate on the whole affair, but needless to say by 1pm, I was feeling quite grumpy and out of sorts. Nothing had really gone my way, and I had just had to buy 2 brand new tires for my car, right after getting the quote for my daughter’s braces. I knew I had to stop the trend of my thoughts and attitudes, and so even though I had many items on my to do list, I sat down instead with a cup of coffee and closed my eyes to rest. As I did that, I prayed through my Monday. It started something like “Lord you know that it’s been a crummy day and now I have to get new tires and everything just costs so much money.” As I continued to work through my list with Him about the things that had gone wrong, I started to find myself thanking Him. You see, the Lord has blessed us currently with a job and dental insurance that we haven’t always had. Braces would not have even been an option 10 years ago. An emergency tire purchase would not have been possible at some points in our married life either, because there just was not any extra after bills were paid. But today we had money we could pull from without putting a hurt on our budget for the month. My husband had left his wallet at home that morning. In the course of our morning I offered to bring him the wallet after our appointment. If we hadn’t met up with him to give him the forgotten wallet, he may not have seen my tire which was in horrendous shape. He was leaving the country shortly also so it could have been a much more extreme situation for me if my tire had blown while he was gone. By the time I was done praying, I felt so much better. While I couldn’t say that I would have chosen each thing that had happened that morning, I could say, thank you for God’s provision in each of those things and a much more positive spirit returned inside of me. If I had carried each of those attitudes throughout the day, I can only imagine how my family would have had to endure my crummy spirit. I’m sure that as each normal thing added to my day, whether that was rain instead of sun, or cooking dinner, or cleaning house, or working through a homeschool math lesson for the umpteenth time my family would have had to bear the brunt of my bitter spirit. Now I wish I could say that this is always my habit. Taking control of my thoughts and attitudes should be an easy habit at this point of my life, but truthfully it’s not. I’ve let my flesh control me so much more than I should and feel as if Paul spoke for me ages ago. do it, but sin that dwelleth in me. I’m not sure how he knew me so well, but I have to remind myself to not grow weary – the process of becoming like Christ is a continual dying to self. Whether that’s a daily choice, or even an hourly one, I must continue to make that choice. As mother’s I think this can be a huge undertaking for each of us. Each season brings its own challenges. When they are babies, we are sleep deprived. Toddlers bring little attitudes, meltdowns and developmental milestones. Adolescence sends us down the road of friends, influences and school, sports and other activities. The teenagers developing their independent streaks can push our buttons in ways we never imagined and the concerns for their choices becomes even greater. The myriad of ways we can be tired as mothers is enormous. Yet, through it all, we have the opportunity to choose. Choose to live victorious and joyful. Choose to view life and all its trials and blessings as gifts to be treasured rather than awful things that have happened to us. Isn’t that what we want them to do as well – and so much of what our children learn happens to be caught not taught. As mother’s (and grandmothers, aunts, etc.) we need to remember that as much as we may have the right to grumble and complain about our circumstances, we can choose a better way and teach the next generation to do the same. Let’s choose to dwell positively today! Try to find the good in each circumstance and thank Him for each blessing as it falls. As we think in our hearts, so will our mouths speak. Love this! It is our choice. 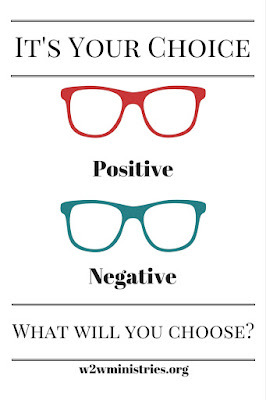 I will choose to be positive today!